Hello friends! The big day is finally here! 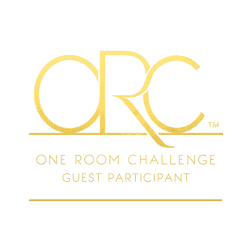 Yep, it’s the One Room Challenge Reveal Day, featuring my Powder Room!!! Yesterday, the featured designers unveiled their finished rooms and today it’s my turn along with the other guest participants. And now it’s Week 6! It’s been a busy and challenging few weeks to say the least. This is the first space that I’ve designed and installed from scratch. With this powder room, I really stepped out of my safe zone as a designer and both Brian and I are thrilled with the end result. My original inspiration for this space could be summed up as light, bright and airy with a color palette of grays accented with gold. I think this space definitely delivers on that. From Day 1 I pushed for shiplap and eventually got my way. We used plywood planks ripped down to 8 inch pieces. Each piece was sanded, primed and painted Swiss Coffee by Kelly Moore. The creamy tones of this paint color really popped out once the trim was painted a bright white. After all the drama with installing the vanity, it’s nice to see it at home in the corner of my powder room. I love everything about it – from the shade of gray to the deep sink. My vision would not have come to life without it! 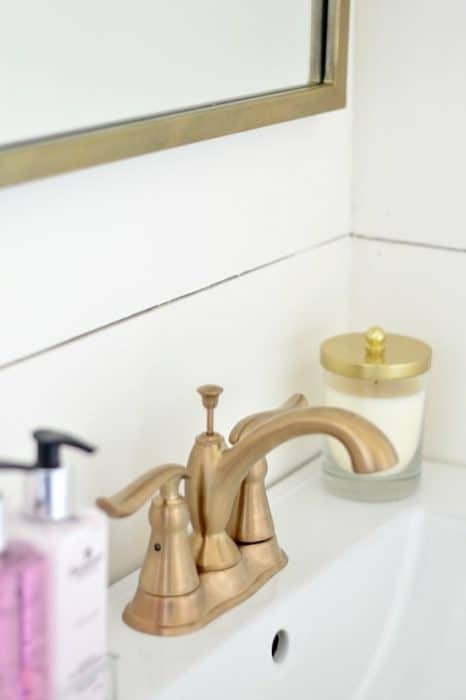 I usually like to play it safe with chrome or nickel but the Champagne Bronze faucet and mirror really are the icing on the cake. 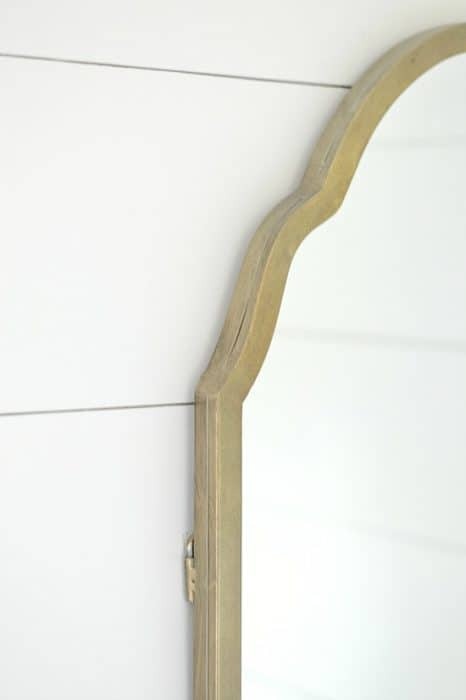 The previously nickel handles on the vanity even got in on the gold action thanks to some spray paint. One of the riskier elements of this design was the cement tile, because of both the busy pattern and slightly trickier installation process. But, I knew that by keeping everything else simple that the floor would be a real statement piece. Plus, I figured a small guest bathroom would be the perfect place to experiment with such a bold pattern. There’s quite the mish-mash of styles happening but repeating certain elements helps make it cohesive. 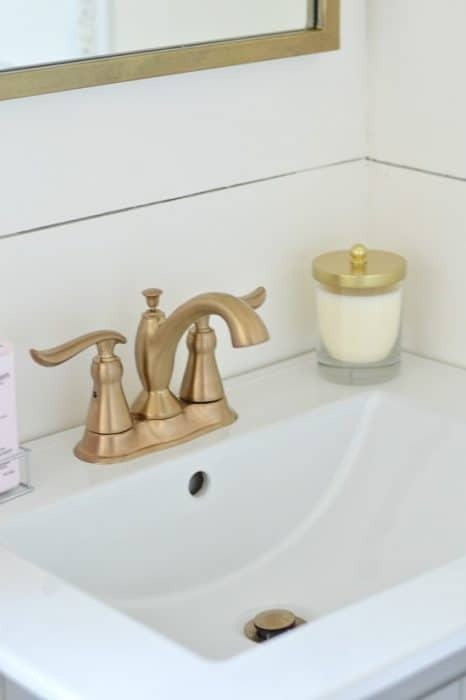 For instance, the champagne bronze is in both the mirror and faucet but is also reflected in the candle and flower holder. 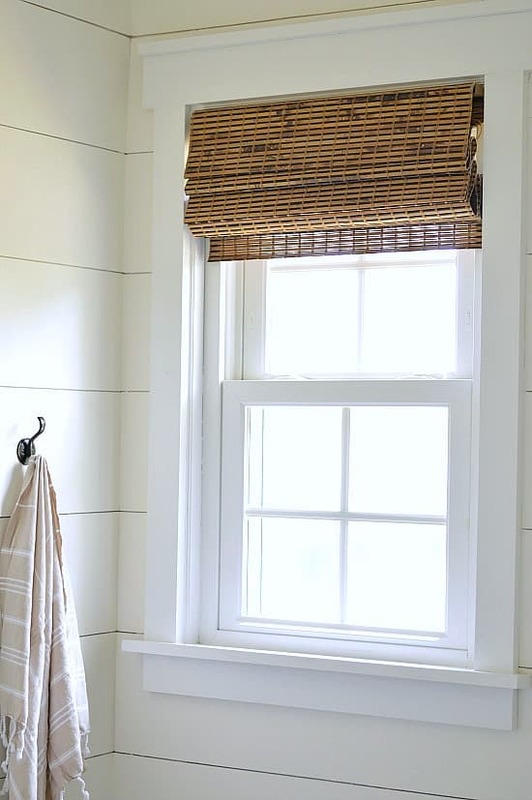 The angular lines of the craftsman style window trim complement the horizontal plank walls and the bamboo shades, the wooden picture frame and the wicker basket help to ground everything and bring that natural, rustic warmth that I think every room should have. 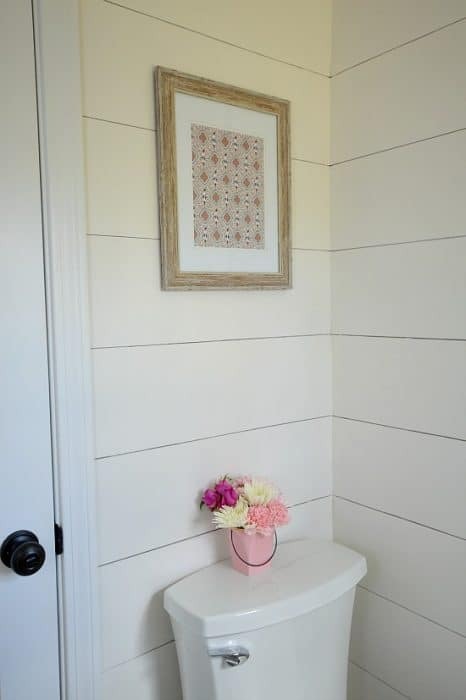 The plank (shiplap) walls were a great DIY that saved us a lot of money. Plus, I don’t think a professional could have done a better job than Brian did! Don’t be afraid to mix metals. Champagne Bronze or Antique Brass pair beautifully with Oil Rubbed Bronze and stops everything looking too gold. We don’t want to get into 90’s brass territory. Restraint is key when it comes to gold – a little goes a long way! For such a small space (5′ x 5′) there’s a lot of visual interest. The horizontal orientation of the plank walls helps draw your eye around the room and take it all in. Clearly, the wide angle lens was needed to capture the majority of these shots. 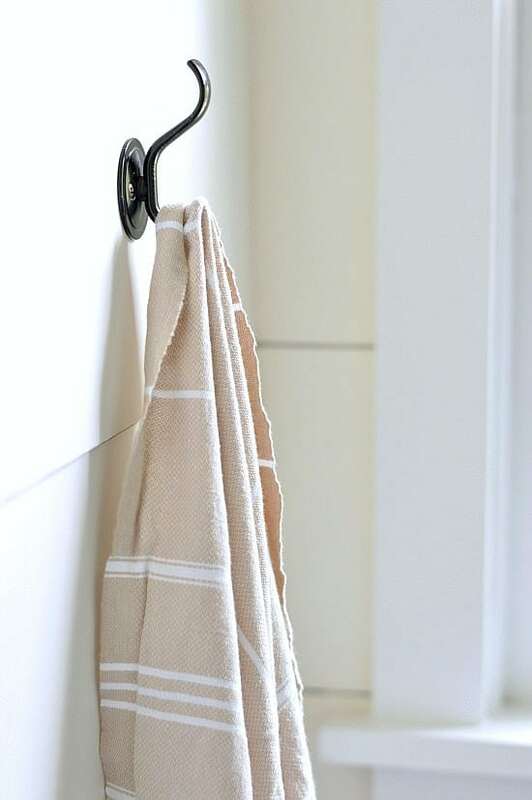 And while it does make the bathroom appear larger than it is, I do think it helps to capture the feeling this space evokes – clean, crisp, warm and fun. Artwork is always the final piece of the puzzle for me. 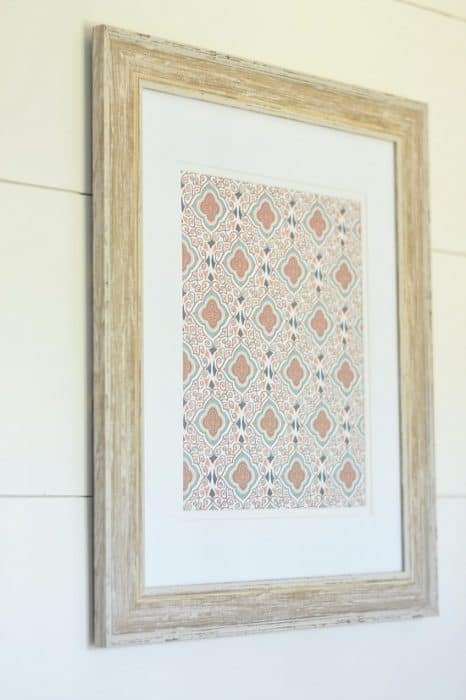 I knew I wanted a wooden frame and while I originally had printed up some botanical prints, the colors of this print helped to add some warmth amid all the grays and whites. Who doesn’t love fresh flowers in their bathroom? Every little detail was carefully thought out – from the color selections to thickness of the wall planks to the ceiling light. It’s all the parts combined that make the whole, after all! 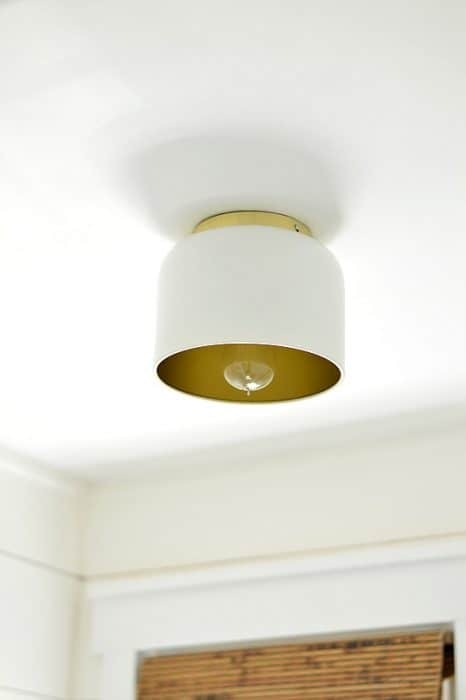 How awesomely retro is this flush mount ceiling light by the way? And one more time…because I cannot stop drooling…. Now I’m off to relax in my tiny bathroom and enjoy the fruits of my labor! ha! I’ll be back next week with the living room reveal that I’ve been promising you! The Cement Tile company has a minimum order. You clearly did not need 52 square feet of tile that is required for a minimum order. Did you buy individual tiles? Hi Allison. They must have changed their policies because there was no minimum order requirement when I purchased. Could you tell me where you got this beautiful tile from? Hi Morgan! All sources are listed at the bottom of the post. Hi Jenna, love your name by the way. I have been looking for a special stencil to try my first stenciled floor. Would you mind sharing how to get it and the colors you used. I finally have the inspiration I needed to try this. Thank you for such an awesome redo! Wow! I am blown away by this amazing transformation. So obsessed with this bathroom design. Incredible work! So pretty! Love the transformation. Your powder room is gorgeous and I love the colors you picked. Thank you for sharing at Dishing it and Digging it link party. Wow! What a transformation! 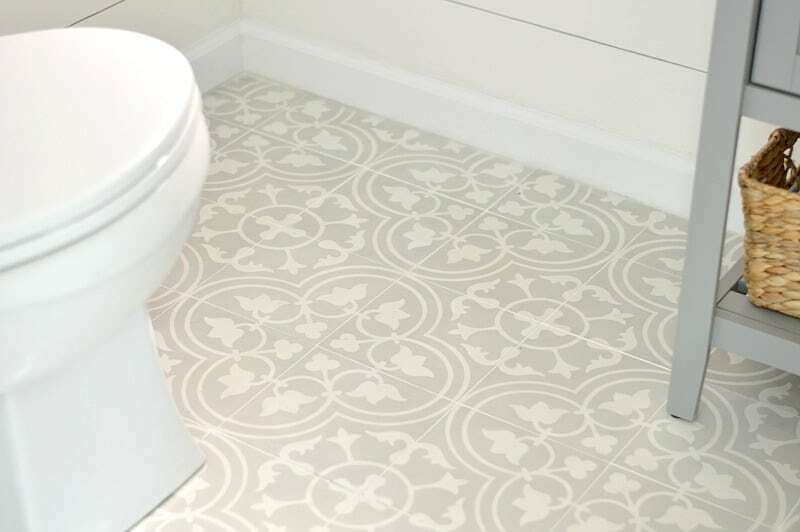 Loving everything about your new powder room-especially the tile and ship lap! Thanks for sharing it on Funtastic Friday! 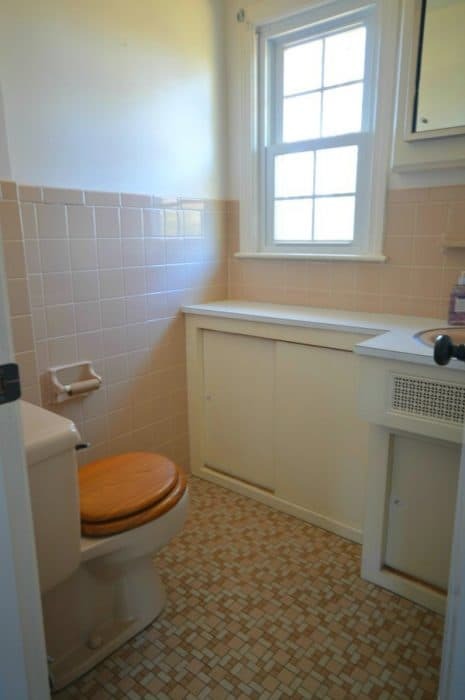 As a military family, I’ve lived in way too many of those 60s bathrooms. I adore your new power room. Grey and white is my favorite color combo. It’s so soothing and sophisticated. Thanks for sharing at the #ThisIsHowWeRoll Link Party. That floor really is stunning. I love how you’ve mixed the metallics too. To say it is transformed is an understatement! Very nice! The floor was the first thing that jumped out at me in the final reveal picture! I love it! I never thought about how you could spray paint cabinet fixtures. I’ll have to remember that! lol. Thanks for sharing your crisp new space with us! Beautiful! This makes my heart happy to see it now! 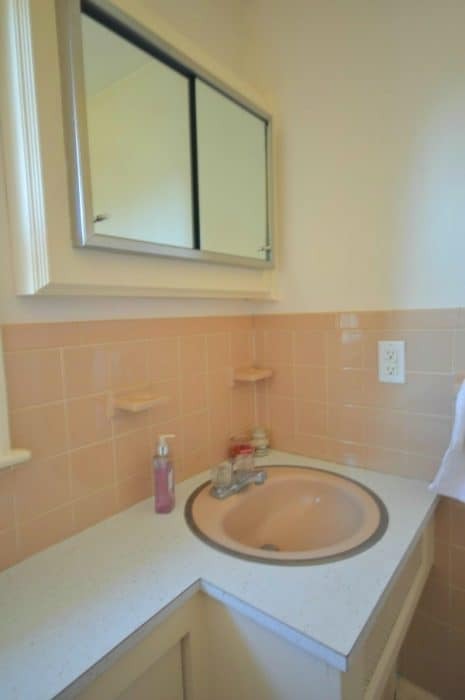 (And give me hope for my TOTALLY PINK) bathroom. Beautiful job! Wow, what a difference. Great job. This is the most beautiful bathroom I have ever seen! I love the grey and gold combination! Would you mind sharing the gold spray paint you used on the hardware? I would love to copy. Hi Mary! Thanks so much! I believe the spray paint was Rustoleum in the color Champagne Mist. I am totally in love with your tile floor!!! What a transformation!! Wow, looks great! Thank you for linking up with us at #HomeMattersParty .See you again next week. Great job and I love the champagne bronze fixtures and cement tiles! I love your fantastic design! We are now also planning to build a new house in our hometown. I think it greatly inspired me. Vel! WOW!!! What an amazing compliment!! Thanks so much for sharing my makeover on your blog – I’m in some pretty talented company I must say!! I know this is cliche, but you seriously went from drab to fab! It looks SO amazing! I’m obsessed!!! The tile and vanity are GORGEOUS and that mirror is perfect!! Pinning! Adorable bathroom! It is just my style! 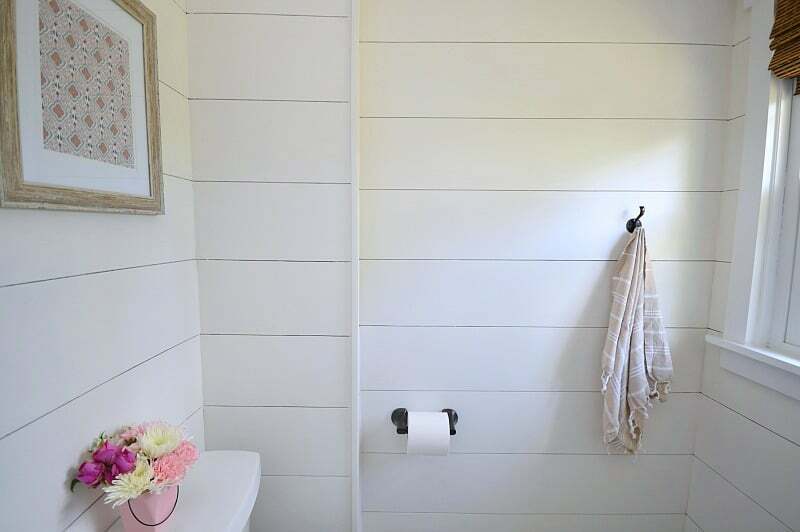 Your shiplap walls look awesome! I love the color you painted it as well! This is spectacular! I keep thinking about the cement tiles for my powder bath. I absolutely love how they transformed your room. All your little touches in here are just perfect! Congrats! It’s absolutely beautiful! What an awesome transformation. I love everything about it! OK, that is just gorgeous!!! I’m digging that vanity, so now I’ll go check out what all the drama was about :) Makes me wonder what the other owners were thinking by making that weird shaped vanity storage cabinet combo thingamajig! I am still crushing on that beautiful tile. Congratulations on a truly stunning transformation! Beautiful transformation! Love that floor! Haha yes it was! 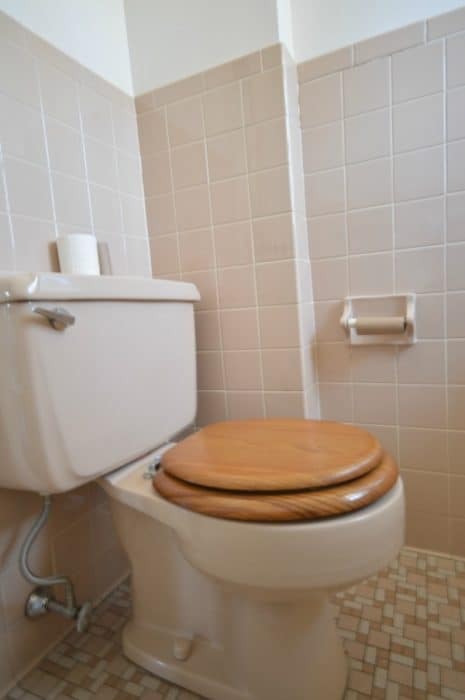 Luckily the professionals knocked the tile out quickly and it’s a tiny bathroom, really! I love this! I’m gonna go look at your vanity post (so I might get my answer there), but what color did you paint it? I absolutely love it. Such a gorgeous space. I’ve been following you with interest for the last six weeks because we have similar taste in floor tile. :) It looks fantastic! What an amazing change!!! It’s gorgeous from the tile to the walls, the whole thing! Congrats!! Jenna!!!!!!!!! (me screaming) this is gorgeous and that floor is everything. Love it! Oh I love this. It’s such a great improvement! So pretty. I love the floors and everything else about this bathroom. Jenna your powder room is dreamy! 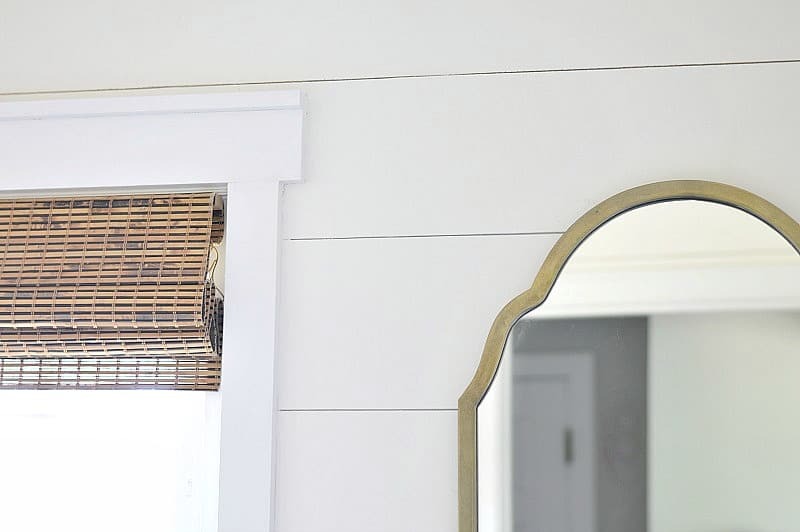 I love everything about it especially the shiplap, tile floor and mirror! Stunning! Those floors are amazing! They are definitely on my wishlist! 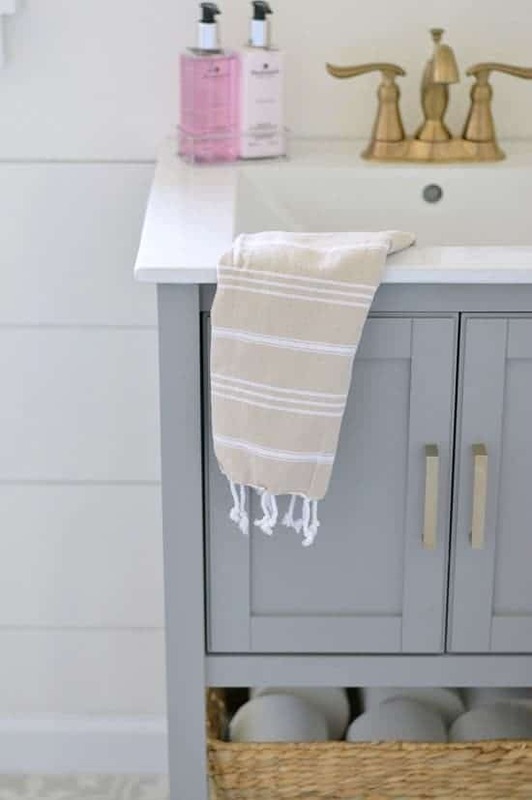 And I love how your shiplap turned out, so pretty! And I love the gray vanity, especially with the gold hardware and faucet. I pretty much just love it all! Great upgrades! I love the flooring especially! Jenna, you make me want to gut my powder room now! WOW! I love all the updates you made! Perfect choices from flooring,to the walls, vanity, everything! Congrats and Cheers to us for another room done! Amazing makeover! Love the gold touches! This is so good! I love it all! Yes, those cement tiles feature so perfectly against the bright walls and neutral tones. Love. This room is so calm and serene. Love the brass mixed with grey. A lovely transformation! Those fixtures are awesome, right? We’re going to buy more for our hallway I think! So, so pretty. 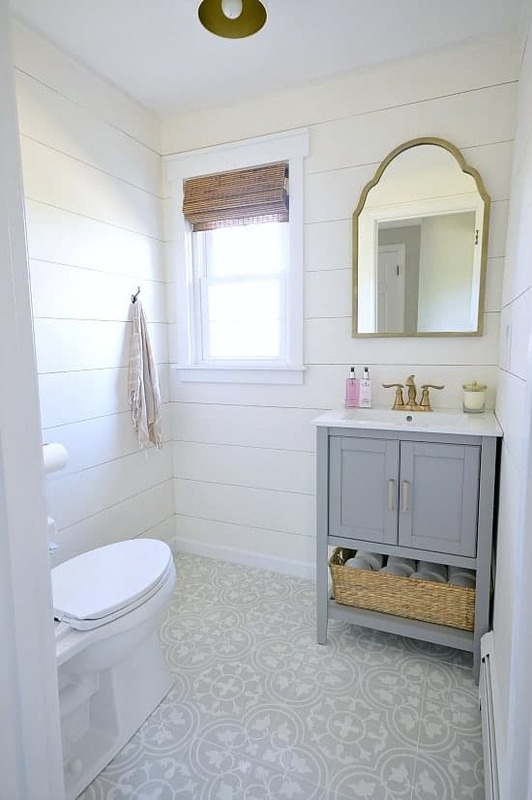 I really love those cement tiles paired with the shiplap. Well Done! This reveal is stunning! Can’t get over the floor tile! Love! The plank walls and the floors look amazing. I can’t believe it’s the same bathroom. Well done! Your bathroom turned out so beautiful! I can’t believe what it looked like before! Love every bit! LOVE this room!! 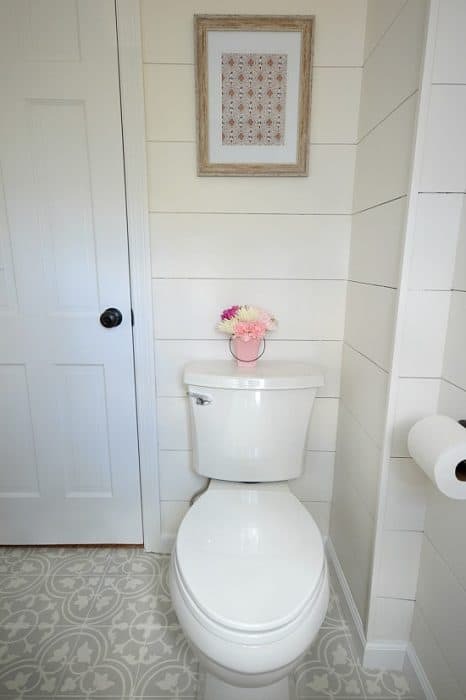 The cement tile and shiplap are absolute perfection, y’all did SO good! The room is so beautiful! I adore the tile so much!! This turned out so beautifully!! I love the mix of styles and how the room looks so fresh and bigger now! Great work! Jenna! It looks so great! What an amazing transformation. You go girl!